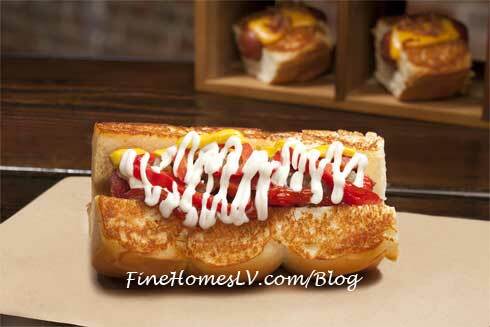 Located at 4480 Paradise Rd., Dog Haus Vegas will be franchisee Ian Vanderburg’s first location with the emerging restaurant brand, which was originally founded by Partners Hagop Giragossian, André Vener, and Quasim Riaz in 2010 to recapture the nostalgic childhood experience of eating a hot dog. As part of Dog Haus’ introduction to the area and its surroundings, guests may stop by from 11 a.m. to 10 p.m. on March 18 to enjoy a free Haus Dog from a selection of Dog Haus’ seven hot dog creations featuring signature all beef skinless dogs served up on grilled Hawaiian rolls. Options will include fan favorites like Sooo Cali, with arugula, tomato, crispy onions, spicy basil aioli and avocado; Downtown Dog, featuring a smoked bacon wrapped dog topped with caramelized onions, pickled red peppers, mayo, mustard, and ketchup; or Cowboy, with white American cheese, smoked bacon, barbecue sauce, and crispy onions. Additionally, all drink sales on Opening Day will be donated to After-School All-Stars Las Vegas, a nonprofit organization dedicated to providing comprehensive after-school programs that keep children sage and help them succeed. Dog Haus’ full menu also includes gourmet sausages, burgers, corn dogs, sides, shakes, and beer, wine and spirits. Other Haus items include The Fonz, which partners a spicy Italian sausage with pastrami and melted mozzarella; while Das Brat features a bratwurst with caramelized onions, sauerkraut, and whole grain mustard aioli. Haus Burgers run the gamut from the trademarked The Freiburger®, with white American cheese, a fried egg, haus slaw, fries and mayo; to Holy Aioli, with white American cheese, caramelized onions, smoked bacon, and garlic aioli. Lighter eaters and kids can indulge in smaller-sized portions – the dog slider is made with a signature all beef skinless mini dog, haus made cheese sauce, and bacon; the burger slider has just the right amount of caramelized onions, white American cheese, and mayo; while the corn dog slider features a signature all beef skinless mini dog dipped in haus made root beer batter. Equal attention is paid to the quality-driven sides, like chili cheese tots or fries with haus made cheese sauce, cheddar cheese, haus chili, and green onions; beer-battered onion. Save room for dessert and finish off the meal with premium ice cream milkshake or soft serve. As with any great Las Vegas experience, diners can complement their meal with a cocktail, can of red or white wine or imbibe from a selection of draught and canned craft beer options that will include a varied range of styles to fit every beer drinker’s taste. Guests can enjoy their cans served up in Dog Haus koozies, a nod to backyard barbecues, or alternatively, all those with a classic PBR craving can get their lager fix with a brown paper bag wrapped can. For an additional boost, the Las Vegas-based concept will exclusively offer alcohol-infused milkshakes. The fast-casual concept, designed to elevate the nostalgic experience of eating that quintessential hot dog or burger, is a welcome break from the hustle and bustle of the Las Vegas Strip. Conveniently located near the Hard Rock Hotel & Casino and directly across from UNLV’s Eller Media Softball Stadium, Rebels students and locals will enjoy the character of Dog Haus and its Southern California vibe mixed with a splash of Vegas personality. After ordering at the counter, diners can grab a barstool at the communal tables with exposed I-beams or claim a seat at one of the reclaimed wood and steel tables with benches that boast playful phrases, such as “Nice Buns,” throughout the restaurant. The 2,500-square-foot restaurant is the perfect setting to watch the game on any of the flat screen TVs or step outside and enjoy a dog on the patio tables to soak in the Vegas sun.